In the last few years, we’ve seen that the ways customers interact with and think of companies — and the experiences they expect in return — is changing dramatically. On May 19, 2001, Apple Inc. officially opened its first two retail stores in Tysons Corner, Virginia, and Glendale, California. The initial public opinion was along the lines of Apple being scoffed at and written off by critics as doomed from the start. But unfortunately for the critics, Apple’s retail operation would go on to become one of the most successful retail brands in existence, boasting the highest sales per-square-foot at $4,551. What made Apple’s retail operation so valuable? Why did it succeed where others, most notably Gateway, had failed? The single biggest reason was the customer experience. “The stores offered a much better way to deliver the product than being in the back of a Best Buy,” said Andrew Neff, an analyst at Bear Stearns & Co. Inc. 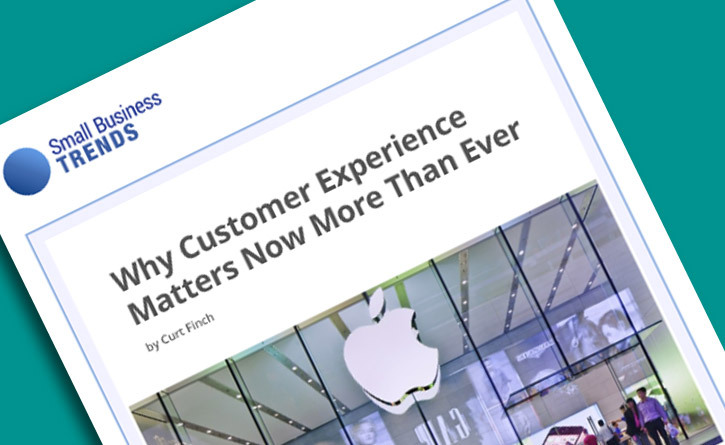 Whether your business is sales or service, there are valuable lessons that can still be learned from Apple’s underdog beginnings about why customer experience matters. The first step when learning from Apple, or any other successful company, is to recognize the need to do so. Every business has one, unfortunately. This is often where companies experience their biggest missteps and flubs, especially in the B2B sector. For far too long, companies and executives have been slow to adopt the principles of B2C marketing, coasting on their reputations or the status of the B2B market in general. But it’s a growing world, and marketing strategies are evolving faster than ever before. As the phrase goes, you either adapt or you die. He then went on to discuss his conversation with a senior executive of a large technology firm that was in the process of changing its approach to its customers because their expectations had evolved over the past ten years. What passed for customer service 10 years ago was no longer satisfactory. Often, these expectations are influenced by companies outside the traditional B2B market. For example, in another article titled “Did You Know You’re Competing With Apple?” Mr. Hinshaw continues to make his case. In the last few years, we’ve seen that the ways customers interact with and think of companies — and the experiences they expect in return — is changing. In some cases, dramatically. Across the board, we’ve seen that customers aren’t just comparing the experience of dealing with you to the best in your industry — which they are, of course — but they’re comparing you against the best experiences in the world. If Apple can make my mobile computing experience easy, why can’t you? If Virgin America can let me tailor my in-air experience (delivering food, music, movies, television when and how I want it) why can’t other airlines? What is it about Apple, as well as these other companies, that doesn’t just rethink the customer experience but break the mold entirely? First and foremost is the focus on customer service. Specifically speaking, this does not mean just showing up will cut it, nor does it mean giving in to every whim. More than either of those things, it simply means that a certain amount of listening is required to get the experience just right. Again, let’s take a look at what Apple does. Any iPhone, iPad or Mac user will happily tell you their experience of taking a device to an Apple Store, sitting at the Genius Bar and having the device repaired or replaced (oftentimes it’s done for free) and often with little regard to whether the device is still under warranty. Because — and here’s the kicker — Apple has made the conscious decision to focus on customer happiness rather than profit. Most likely, we’ve all seen the television show Hoarders (and if you haven’t, consider yourself lucky). It’s shocking to see how some are actually putting their own lives in danger for the sake of holding onto their belongings. Unfortunately, many organizations do this same thing in their own way, and it’s not any prettier when viewing it from the perspective of the customer. That’s why a hallmark factor of the Apple Retail experience is the educational value. Throughout any given day, Apple Stores offer free in-house workshops to help individuals learn how to use their devices. Whether it’s the basics of Mac OS X, getting the most from your iPhone or how to edit and enhance your photos, there’s a workshop you can sign up for. Again, Apple has realized that the customer experience is about far more than the bottom line: it’s about helping customers gain the most benefit from the products and services they buy. You’d be hard-pressed to find someone who’s visited an Apple Store and experienced a hard sell. It’s not uncommon to experience the exact opposite — to show up thinking you need a certain model computer, phone or iPad only to have the sales staff point you in the direction of a less expensive configuration that will serve you just as well. This type of market response is the exact reason why Apple is actually giving their customers a voice, empowering them with knowledge and listening to what they have to say when it comes to product development and company decision-making. The markets talk, and if your share is dwindling, consider that this might be the very reason why. When you take these factors into consideration, what do they add up to? Customers who consistently rank among the most loyal in the world. Because the company that has earned their loyalty has done so by focusing on meeting their needs first, educating them and not taking advantage of them with hardline, up-selling tactics. The end result is a great lesson about why customer experience matters — and customers who will gladly pay a premium to be treated well. If you'd like to speak with someone at McorpCX to learn more, please reach out!